Growing up, I never saw myself becoming a beekeeper. Like most people, all I knew about bees is that they make honey and sting people. However, now that I have taken on the hobby of beekeeping, I realize there is so much more to the honey bee. Since I am a beekeeper by weekend and work at a native seed company during the week, I often get asked by fellow beekeepers, “What are the best native plants for my honey bees?” When I was first asked this question, I pondered this because I know that the European honey bee is not native to the United States of America. Would the honey bee use plants that are native?? 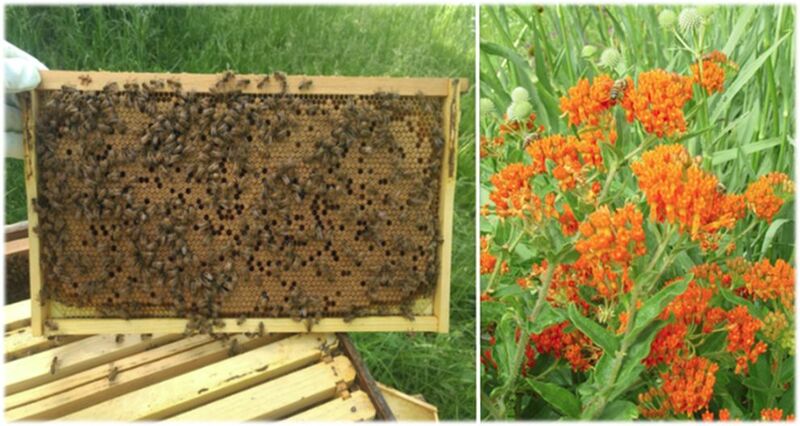 So, I began to watch while working with the native plants to see if the honey bee visits native plants. Early spring is the time the bees are waking up from a long winter and need a good source of pollen and nectar. The spring months are extremely important for the bees because they set the pace for the rest of the year. Jacob's Ladder (Polemonium reptans) is a shade loving plant that blooms early and is easily spread by seed. It grows to be 9”-12” tall and likes average to moist soil. Jacob’s Ladder is a great pollen source, and the honey bees find it to be quite attractive. Ohio Spiderwort, (Tradescantia ohiensis) and Golden Alexanders (Zizia aurea) are also good spring native plants for the honey bee. Summer is the time for the beekeeper. If there is not enough nectar for the bees, there will not be a fall honey harvest for the beekeeper. Native plants are amazing plants even in the hottest and driest part of the year because they always seem to bloom, which is very important for the honey bee because the honey bee needs plants in bloom throughout the growing season; just like us, they don’t like to miss a meal. Black-eyed Susan (Rudbeckia hirta) is a very versatile plant that can handle dry to moderately moist soil. Black-eyed Susan is a biennial that often reseeds and does not require replanting, and it is a great source of pollen and nectar. Gray-headed Coneflower (Ratibida pinnata) and Rattlesnake Master (Eryngium yuccifolium) are also highly favored summer plants by the honey bee. Fall is the time for the honey bees to get ready for a long winter. The bees need an abundance of nectar to have enough honey to get through the winter. Rigid Goldenrod (Solidago rigida) is a bright yellow flat-topped flower that is a great source of pollen and nectar. Other good fall plants, which are the relatives of Rigid Goldenrod, include Gray and Showy Goldenrod (Solidago nemoralis and speciosa). My answer to the common question of “What native plants do honey bees use?” is that the honey bee doesn’t use all the native plants, but it sure does have some that it loves. So, by planting these plants and others like them we can provide pollen and nectar for our bee population. A special thanks to our bee enthusiast, Dawson Smith, for sharing his observations about the honey bee’s usage of native plants and writing this article. Want more articles like this? Sign up for our monthly newsletter.